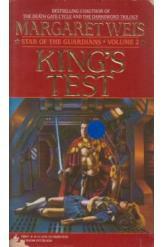 King's Test by Margaret Weis, Sci Fi, book is in good condition, all pages intact. With the alien Corasians repelled, Derek Sagan and Dion resume their campaign to overthrow the corrupt galactic regime. The key to victory is a hidden weapon of terribly power, but Sagan and Dion must find it before it can fall into the hands of Lady Maigrey, or worse, a psychopathic genius named Abdiel. Book 2 of the "Star of the Guardians" series.